An investigation into the demonic, Marxian view of the proletariat over time. One of the most common charges leveled at Marxists is that, for all their atheistic pretensions, they retain a quasi-religious faith in the revolutionary dispensation of working class dictatorship. "It's become an almost compulsory figure of speech to refer to Marxism as a Church," observed the French literary critic Roland Barthes in 1951. Barthes was reviewing a book by the surrealist author Roger Caillois, which had just been released, but if anything the use of this lazy metaphor has grown more frequent over time. Just a few years after Barthes' review was published, the public intellectual Raymond Aron came out with a polemic cuttingly titled The Opium of the Intellectuals (1955). He'd lifted the title from a bon mot by the philosopher Simone Weil, who despite her youthful Bolshevism in the twenties had gone on to publicly debate Leon Trotsky during the thirties. Repeating this old anticommunist jibe, Aron quipped that "in Marxist eschatology, the proletariat is cast in the role of collective savior… that is, the class elected through suffering for the redemption of humanity." Evidently, in Aron's understanding, workers were held up as an object of mythic exaltation among the socialists. To be sure, some of the language adopted by Marxists — e.g., heresies, dogma, sects, orthodoxy, schisms — is clearly borrowed from theological disputes. Furthermore, the recantations made by ex-communists at times seems to lend credence to this view. You need look no further than the famous 1949 essay collection The God that Failed for proof of this fact. Wolfgang Eckhardt's newly-translated study of The First Socialist Schism (2016), on the split between Bakunin and Marx in the Workingmen's International, is only the latest in a very long line of examples. André Gorz opened his Farewell to the Working Class (1980) with a chapter on "The Working Class According to Saint Marx," riffing on the section of The German Ideology dedicated to a critique of "German socialism according to its prophets." Gorz thus concluded that "orthodoxy, dogmatism, and religiosity are not accidental features of Marxism, since the philosophy of the proletariat is a religion." More recently, the former Situationist TJ Clark confessed that his own Farewell to an Idea (1999) will likely be seen "as a vestige of early twentieth-century messianism." Clark sardonically added that "if I can't have the proletariat as my chosen people any longer, at least capitalism remains my Satan" (though he got this last part a bit mixed up, as we shall see). When socialist writers ascribe [a] world-historic role to the proletariat, it is not at all… because they regard the proletarians as gods. Rather the contrary. In the fully-formed proletariat the abstraction of all humanity, and even of the semblance of humanity, is practically complete. The conditions of life of the proletariat sum up all the conditions of life of society today in their most inhuman form; since man has lost himself in the proletariat, and at the same time has not only gained theoretical consciousness of that loss, but through urgent, no longer removable, no longer disguisable, absolutely imperative need — the practical expression of necessity — is driven directly to revolt against this inhumanity, it follows that the proletariat must emancipate itself. But it cannot emancipate itself without abolishing the conditions of its own life, and cannot abolish the conditions of its own life without abolishing all the inhuman conditions of life of society today which are summed up in its own situation. Expanding on this passage, the French phenomenologist Maurice Merleau-Ponty insisted on the terrestrial foundations of the Marxist hypothesis. "If [Marxism] accords a privilege to the proletariat, it does so because on the basis of the internal logic of its condition… apart from any messianic illusion," he claimed in Humanism and Terror (1947). "Proletarians, 'who are not gods,' are the only ones in a position to realize humanity. Marxists discern a mission in the proletariat — not a providential, but an historical one — and this means that, if we take the proletariat's role in the present social constellation, it moves toward the recognition of man by man…" Nevertheless, in the meantime workers are hardly godlike; indeed, they're barely even human, if Marx and Engels are to be believed. As the former would later explain in Capital (1867), "manufacture proper not only subjects the previously independent worker to the discipline and command of capital, but converts the worker into a crippled monstrosity." His description is reminiscent of the lyrics to that old Tennessee Ernie Ford song "Sixteen Tons," written about a Kentucky coal miner in 1947: "Some people say a man is made outta' mud / A poor man's made outta' muscle and blood / Muscle and blood and skin and bones / A mind that's a-weak and a back that's strong / You load sixteen tons, what do you get? / Another day older and deeper in debt / Saint Peter don't you call me 'cause I can't go / I owe my soul to the company store." Over and above the image of the proletariat as divine redeemer, here emerges a picture of the proletariat as beyond redemption. Workers have sold their souls to the company store. Consider the following lines from Marx's Capital on the topic of automation: "An organized system of machines, to which motion is communicated by the transmitting mechanism from an automatic center, is the most developed form of production by machinery. Here we have, instead of the isolated machine, a vast mechanical monster whose body fills whole factories, and whose demonic power [dämonische Kraft], at first hidden by the slow and measured motions of its gigantic members, finally bursts forth in the fast and feverish whirl of its countless working organs." Little wonder that the Italian left communist Amadeo Bordiga drew upon these words in elaborating his own "Doctrine of the Body Possessed by the Devil," from 1951. Quoting Marx, who in turn was quoting Goethe, Bordiga explained how, "by incorporating living labor into capital's lifeless objectivity, the capitalist simultaneously transforms value, i.e. past labor in its objectified and lifeless form, into capital, value which can perform its own valorization process, an animated monster which begins to ‘work’, ‘as if possessed by the devil’.” The dispossessed (which is, after all, just another word for "proletariat") are thus demonically possessed by the alienated products of their labor. For Marx, this was all part of "the magic and necromancy [der Zauber und Spuk] that surrounds the products of labor on the basis of commodity production." There is an angelic view of the exploited (that of Rousseau, Karl Polányi, E.P. Thompson) and there is a demonic, Marxian view. For Marx, the road to the end of capitalism (and beyond) leads through the completion of capitalism, a system of economic and intellectual growth, imagination, waste, anarchy, destruction, destitution. It is an apocalypse in the original Greek sense of the word, a “falling away of the veils” which reveals all the social mechanisms in their stark nakedness; capitalism helps us to know because it is unable to sustain illusions, especially naturalistic and religious illusions. It liberated subjects from their traditional rootedness (which was presented to them by the ancien régime as “natural”) to hurl them onto the labor market where their productive-creative essence reveals itself to be disposable, replaceable, dependent on demand — in other words, wholly alien to self-perception or “inner worth.” In capitalism, what human beings are, is contingent or stochastic; there is no way in which they are as such, in themselves. Their identity is limited by the permanent reevaluation of the market and by the transient historicity of everything, determined by — among other contingent factors — random developments in science and technology. What makes the whole thing demonic indeed is that in contradistinction to the external character, the incomprehensibility, of “fate,” “the stars,” participants in the capitalist economy are not born to that condition, they are placed in their respective positions by a series of choices and compulsions that are obviously manmade. To be born noble and ignoble is nobody’s fault, has no moral dimensions; but alienation appears self-inflicted. Marx is the poet of that Faustian demonism: only capitalism reveals the social, and the final unmasking; the final apocalypse, the final revelation can be reached by wading through the murk of estrangement which, seen historically, is unique in its energy, in its diabolical force. Marx does not “oppose” capitalism ideologically; but Rousseau does. For Marx, it is history; for Rousseau, it is evil. Here Tamás was somewhat unfair to Thompson — not to mention Rousseau — but his caricatured presentation served to throw their perspectives into sharper relief. Thompson may have been guilty, from time to time, of romanticizing the English working class, but he entertained no illusions as to the hellish conditions out of which it emerged. After all, it was Thompson who wrote of "the denizens of 'Satan’s strongholds' [inhabitants of proletarian neighborhoods in industrial cities], of the 'harlots, publicans, and thieves' whose souls the evangelists wrestled for in a state of civil war against the ale-houses." Every religious doctrine of the age, stated Thompson, had to be "held up to a Satanic light and read backwards" so as to properly grasp their context. One popular Methodist refrain, which he noted in his Making of the English Working Class (1963), spoke of factories as follows: "There is a dreadful Hell, / And everlasting pains, / Where sinners must with devils dwell, / In darkness, fire, and chains." Regarding "that monstrosity, the disposable working population held in reserve" (to quote Capital), Thompson echoed Marx's military metaphor in describing "…an unsettling element in the formative working-class community, a seemingly inexhaustible flow of reinforcements to man the battlements." There is a sect, originated recently, adherents to a system called "secularism," the creed that probably with most exactness indicates the faith that virtually, though not professedly, is adhered to by the bulk of our working population; by the skilled and unskilled laborer alike — by hosts of minor shopkeepers and Sunday traders — and by miserable denizens of courts and crowded alleys… unconscious secularists. Engrossed by the demands, the trials, or pleasures of the passing hour, and ignorant or careless of the future, they are never (or are but seldom) seen in our religious congregations. And this melancholy fact impresses upon us that those classes which are most in need of the restraints and consolations of religion are the classes which are most without them. Engels reported two decades later this same attitude extended to the Continent. "In the European workers’ parties atheism is more or less self-understood… As regards the German Social-Democratic workers, …they no longer stand in theoretical, but only in practical opposition to all belief in God: they are simply through with God." Marx likewise opined in a June 1869 letter to his future son-in-law Paul Lafargue that "the German working class… is better organized than the French. Its ideas are more international than in any other country, and its atheism is more pronounced." Champions of rural peasant movements, like the world-renowned Russian novelist and Christian anarchist Leo Tolstoy, often felt less comfortable when it came to urban workers' movements. "One can rightly say that the proletariat, as such, did not exist for Tolstoy," remarked the Soviet Commissar of Enlightenment Anatoly Lunacharsky. "He considered them to be children of the satanic city [дьявольского города], i.e. madmen who used violence to quench violence, further increasing the hellish confusion [адову смуту] of advancing pseudocivilisation while striving in vain to tempt simple folk with crude promises of plunder, redistribution, and false carnal well-being. It could scarcely have been otherwise. 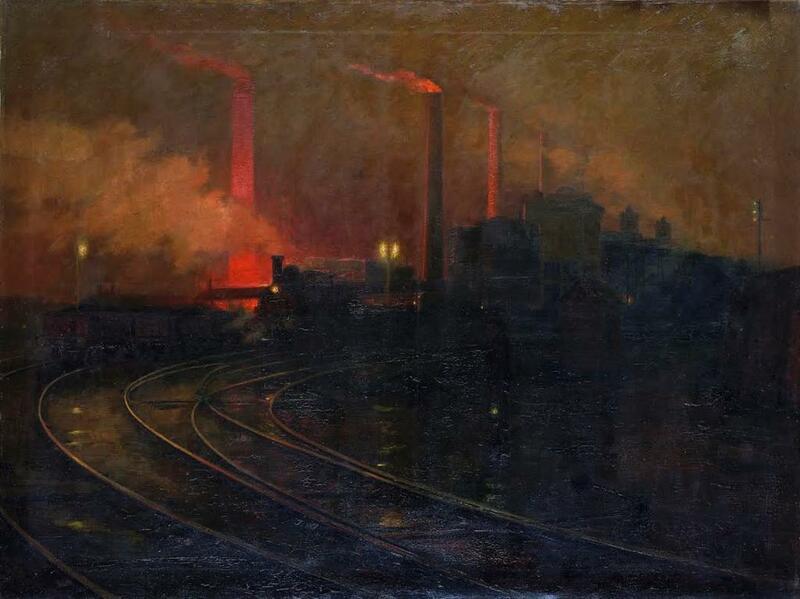 William Blake, Thompson's favorite Romantic, had coined the phrase about the "dark, Satanic mills" that came to symbolize the Industrial Revolution. Engels' recollections of the "great towns" of England, written just a couple decades on, were very much in keeping with Blake's overall vision: from the "narrow, dark, damp, badly-ventilated cellar dwellings" of Manchester, "ordinarily very dirty and inhabited almost exclusively by proletarians," to the "planless, knotted chaos of houses… more or less on the verge of uninhabitability" in Irk, i.e. "whose unclean interiors fully correspond with their filthy external surroundings." And so on down the line, since "what is true of London, is true of Manchester, Birmingham, Leeds, is true of all great towns. There is barbarous indifference, hard egotism on one hand and nameless misery on the other, social warfare and reciprocal plundering all under the protection of the law, so shameless, so openly avowed that one wonders how the whole crazy fabric hangs together." But if Marx's proposition that social consciousness reflects social being is correct, and not the other way around, then it is to be expected that these demoniacal qualities would eventually migrate from the object to the subject. Look at the English proletariat, at what capital, that is to say their labor, has done to their body. You will tell me, however, that it was that or die. But it is always that or die, this is the law of libidinal economy, no, not the law: this is its provisional, very provisional, definition in the form of the cry, of intensities of desire; “that or die,” i.e. that and dying from it, death always in it, as its internal bark, its thin skin, not yet as its price, on the contrary as that which renders it unpayable. And perhaps you believe that “that or die” is an alternative?! And that if they choose that, if they become the slave of the machine, the machine of the machine, fucker fucked by it, eight hours, twelve hours, a day, year after year, it is because they are forced into it, constrained, because they cling to life? Death is not an alternative to it, it is a part of it, it attests to the fact that there is jouissance in it, the English unemployed did not become workers to survive, they — hang on tight and spit on me — enjoyed [ils ont joui de] the hysterical, masochistic, whatever exhaustion it was of hanging on in the mines, in the foundries, in the factories, in hell, they enjoyed it, enjoyed the mad destruction of their organic body which was indeed imposed upon them, they enjoyed the decomposition of their personal identity, the identity that the peasant tradition had constructed for them, enjoyed the dissolution of their families and villages, and enjoyed the new monstrous anonymity of the suburbs and the pubs in the morning and evening. Whether or not the workers enjoyed the mad rush of industrialism is rather beside the point, however. It is enough to say that they endured this oblivion and were shaped by the experience. "Bathed in the fire of labor, the English working men are the firstborn sons of modern industry," Marx proclaimed in a landmark 1856 speech. "The newfangled forces of society… want only to be mastered by newfangled men. Such are the working men, who are as much the invention of the times as machinery itself…" Next to them, Marx subsequently maintained, "the so-called revolutions of 1848 were but poor incidents, small fractures and fissures in the dry crust of European society. Yet they denounced the abyss. Underneath the apparently solid surface, they betrayed oceans of liquid matter… only needing expansion to rend into fragments continents of hard rock. Loudly and confusedly they declared the emancipation of the proletarian (i.e., the secret of the nineteenth century, and of the revolution of that century)." For Marx, this proletariat was not just Promethean but Luciferian, as well. Henri Lefebvre's comment that "the children of the nineteenth century loved the gods Prometheus and Satan" seems especially apt here. Baudelaire's satanism should not be taken too seriously. If it has any genuine significance, it is as the only attitude in which Baudelaire was able to sustain a nonconformist position for any length of time. Among the upper classes cynicism was part of the accepted style; in the lower classes, rebellious pugnacity was the norm. Baudelaire was thoroughly familiar with this dual aspect of Satan. To him, Satan spoke not only for the upper crust but for the lower classes as well. The last poem in the cycle is, by virtue of its theological content, the miserere of an ophiolatrous liturgy. Satan appears with his Luciferian halo as the keeper of profound knowledge, as an instructor in Promethean skills, as the patron saint of the stubborn and unyielding. Here flashes the dark head of Blanqui: Toi qui fais au proscrit ce regard calme et haut / Qui damne tout un peuple autour d'un echafaud. ["You who give the outlaw that calm, proud look / Which can damn an entire multitude gathered around a scaffold"]. Yet Benjamin was not alone in seeing the silhouette of Blanqui as Satanic. Eugène de Mirecourt, the literary opponent of Alexandre Dumas, concurred with Benjamin on this score… Mirecourt dubbed Blanqui "the most cynical of demoniac conspirators for the loss of modern society" [«le plus cynique des démoniaques conjurés pour la perte de la société moderne»]. If the proletariat is demonic, as Tamás has argued, then it is only fitting that the first professional proletarian would be demonic as well. (Blanqui, in the proceedings taken against the Société des Amis du Peuple, was asked by the presiding judge to state his profession. He answered that he was a "proletarian." When the judge expressed doubt whether this was a legitimate profession, Blanqui countered that "it's the profession of thirty million Frenchmen who live by their labor, yet are deprived of political rights…") And so it goes with other great revolutionary theorists of the working class. Such as, for example… Karl Marx, to name only the most prominent. It leaps to the brain from Hell's black mists. “You see,” he had once written Engels, “that I’m the object of plagues just like Job, though I’m not so god-fearing as he was.” No: he is not so god-fearing. He sees himself also as “Old Nick,” the Goethean spirit that denies. But Old Nick is not the right symbol either: this Devil has been twisted and racked. Though he is capable of satanic mockery of the publisher who had sent Kriege on their necks and then fallen and broken his own, the mocker cannot jeer at such a doom without breaking, by a dialectical joke, his own neck as well; and, after all, had not the publisher buried Marx’s book alive? It is Prometheus who remains his favorite hero; for Prometheus is a Satan who suffers, a Job who never assents; and, unlike either Job or Satan, he brings liberation to mankind. Prometheus turns up in Capital to represent the proletariat chained to production. The Light-Bringer was tortured, we remember, by Zeus’ eagle tearing, precisely, his liver, as Karl Marx himself — who is said to have reread Aeschylus every year — was obsessed by the fear that his liver would be eaten like his father’s by cancer. And yet, if it is a devouring bird which Father Zeus has sent against the rebel, it is also a devourer, a destroyer, fire, which Prometheus has brought to man. Fyodor Dostoevsky, the great nineteenth-century Russian novelist, made his own contribution to counterrevolutionary demonological literature in 1871. Revolutionary possession was not the exclusive preserve of French or German radicals, as Dostoevsky was keen to point out. Demons [Бесы], sometimes translated as Devils or The Possessed, fictionalized the real-life tale of the Petersburg terrorist Sergei Nechaev, a former disciple of Bakunin. Nechaev at the time was the focus of an international manhunt, a fugitive from justice. He had murdered a fellow member of his anarchist cell in 1869 out of paranoia, believing his former comrade to be a police informant. After the authorities caught up with him in Switzerland three years later, Nechaev was extradited to Russia. Marx and Engels, both of whom he'd met, monitored the highly-publicized trial that followed from afar. Verkhovensky, Dostoevsky's fictional Nechaev, is not at all the central character in Demons, however. That honor belongs to his mentor, Stavrogin, a vaguely Bakunin-like figure who asks: "Can one believe in a demon, without believing at all in God?" [«А можно-ли веровать в беса, не веруя совсем в Бога?»]. Keep this question in mind, since the Marxist theoretician Ernst Bloch would later claim that "Enlightenment and atheism do not overthrow 'the Satanic' along with the God-hypostasis." Nikolai Berdiaev, who briefly belonged to the RSDLP in the 1890s before becoming a conservative ideologue, asserted in his treatise on Dostoevsky's Worldview (1923) that “a revolution is possession [одержимость], madness. This possession, this madness strikes at the personality and paralyzes its freedom, its moral accountability, which leads to loss of self, to one's subjugation by impersonal and inhuman elements. Figures of revolution do not know what kind of spirits they possess. In their activity they are essentially passive, spiritually at the mercy of the demons [бесов] they've fashioned fashioned for themselves…" Dostoevsky thus augured the October Revolution, according to Berdiaev. And indeed, to their enemies, it certainly seemed the Bolsheviks were possessed by the devil. Leon Trotsky later recalled in his History of the Russian Revolution that "the word 'Bolshevik' became a synonym for demonic origin" (Max Eastman translated адского начала a bit less literally, as "Satanic origin"). He experienced enough of this firsthand, no doubt, since his image appeared on multiple counterrevolutionary posters with pentagram necklaces. More than seventy years later, the historian Dmitri Volkogonov — onetime Stalinist hagiographer turned bitter anticommunist — wrote an article entitled "Trotsky, Demon of the Revolution" (1988). Apparently we cannot get along without the devil. Nowadays it is clear to us that out worthy ancestors met an elemental need with Satan, who was to them an ever-present reality, in a way even their most orthodox descendants can scarcely imagine. In our more materialistic age, we have naturally passed from theological to nationalistic and now to economic demonology... Our newspaper editors have now set their vivid imaginations to work and have obligingly created for us a new and fearsome devil by the simple process of adding a Russian blouse, a ragged beard, and a few additional years to the figure [of Wilhelm II] that served so well during the war. Behold, the Bolshevik stands forth! What is Bolshevism? Those who mistake imagination for knowledge answer glibly with a string of words like anarchy, murder, rapine, massacre, free love, government ownership, and bloody revolution — or so say the pressmen, politicians, and profiteers, as well as some parsons. "Karl Marx, Death, and the Apocalypse…" is the final chapter in the 1923 edition of Ernst Bloch's Spirit of Utopia. Fredric Jameson has rightly noted that "Bloch is not so much a Marxist philosopher as a 'theologian of the [October] Revolution,' to quote his description of Thomas Münzer." Georg Lukács, who was a close friend of Bloch's around the time Spirit of Utopia came out, was widely regarded as "the philosopher of the October Revolution," so this is only fitting. (Paul Honigsheim, a fellow contributor to Max Weber's Heidelberg sociology circle, affectionately referred to Bloch before the war as "the catholicizing apocalyptic Jew, along with his follower Lukács.") In the aforementioned chapter, Bloch thundered that "the War and all the White Terror generally showed us what kind of God inhabits the interior of a despotism." He continued: "The state as coercive formation culminates in a military apparatus, which proves to have such an abstract monopoly on power that… the state reveals itself as a discrete, heathenish, satanic coercion-materiality. May it have a Bolshevistic function for a time as a transitionally necessary evil, but the truth of the state must be that it withers away, transforms into an international regulation of consumption and production." As Bloch faithfully explained, proletarian dictatorship would just be the state set to auto-destruct: "This ephemeral alliance with state power is possible for Marx because the proletarian himself already represents the dissolution of society as such." None of the leading revolutionaries of 1917 to 1923 entertained any illusions about the role violence would play in facilitating the post-capitalist transition. "In the words of Marx," invoked Engels in Anti-Dühring (1877), "it is the midwife of every old society pregnant with a new one." So it should come as no surprise that Marxists amid an apocalyptic civil war would be unfazed by brutal exigency. “Every state is founded on Gewalt,” asserted Trotsky in 1918, unsentimental as ever. “We shall not enter the kingdom of socialism wearing white gloves on a polished floor.” He was known to quote Nietzsche's Zarathustra in speeches to the Red Army: "Verily… one must have chaos in one's heart to give birth to a dancing star." Meanwhile, continued Bloch, "how powerfully the demiurgic principle, incited to vengeance by its other, is still able to retreat, and what a terribly final, absolute kind of dying is still available in the physical world: as the pitiless scene of our Kingdom." Bloch was less clear about how Marx fit into this whole apocalypse. Where his name did appear was usually in the interaction of being and consciousness, the repercussion of the superstructure on the base. "Marx defined the proper maxim of the scientific socialism as being that our consciousness does not determine our being, but on the contrary our economic being determines our consciousness, or serves as the breeding ground of our ideas," wrote Bloch. "At any rate, the proportions which Marx allotted to interest — that is, the voluntaristic moment — aren't clearly defined. He wants to change the world, and so not only awaits the appearance of conditions but also teaches us to create them, by positing the class struggle and analyzing the economy in terms of those variables [susceptible to] active intervention." Lukács argued along analogous lines, albeit in less mystical tones, in the dialectic of subject and object he traced in History and Class Consciousness (1923). Countering the critique László Rudas had written of this work, Lukács amusedly remarked in Tailism and the Dialectic (unpublished notebook, 1925/1926): "I apparently turn consciousness into a historical demon, a 'demiurge of actuality'… Yet this 'historical demon' [is nothing other than] the Communist Party." They slowly flew off together, Rosa and Satan, beneath the sable sky of night. He said: "We live at the border between heaven and earth, between day and night. We have chosen this place so that we may easily move about in both directions. You have done well, Rosa, to decide to join me. You have taken up with the stronger side. You no longer expect things that don't depend on your own actions." Rosa: "What do you do?" Satan: "You should ask what I do not do. I must bring order to a world that others have made a botch of. My friends and I have our hands full doing that. It is easier to create something new than to make amends for mistakes. He, the other one, simply plunked down his creation. He thought that he could create the universe with the means at his disposal. It got stuck in the planning stages. What did he want? Peace? Harmony? But he created the world from nothing, and time and matter became part of his plan but did not fit the plan. His error was patently obvious, but he did not want to see it. He saw the error in his world, but did not want to admit it was there. And certainly not to me, whom he had likewise created. He would not let himself be convinced. And so I and others of his host conspired against him. And when he caught on to our plot, he attacked me and struck out against me with all his might, not in order to improve his world, but to throw us into the abyss." Karl Marx: Who are you? And what devilish kind of machine is this? Satan: Someone who has been wronged but who can accomplish a great deal. It's an invention that I am putting at the disposition of the proletariat to contribute to its emancipation and to aid in its victory against capitalism. Look through that porthole. Do you see the earth at your feet? Behold the kingdoms of the earth. You can have any one of them, and make communism triumph there. What do you say? I especially recommend to you the empire of the tsars. It alone occupies one-sixth of the world and its poor, ignorant, oppressed, starved population that breeds and multiplies unceasingly offers you admirable material. It is new and will give enthusiasm to any new thing that has a breath of grandeur. Its intellectuals are young, ardent, nervous, extreme, impatient to sacrifice themselves. Marx: I don’t want it, and I don’t want any other. It is not by the path of political struggle that I intend to emancipate the proletarians. Satan: Then by what path, Herr Marx? Doesn’t your program include the conquest of power? Karl Marx: Certainly, but not in the way you seem to believe. A mistake of that kind would prove fatal to the future of the social revolution. Should I advise the proletariat to organize itself in a single national state or a single national party, modeled on all those that exist? Error and madness. The real battleground is consciousness. Let it remain there. Having laid down the rules of a critical method that allows us to comprehend history, society, and the economy, I should be careful not to search for a point of political application. That'd mean abandoning revolutionary dialectic for the profit of opportunism. By a series of consequences we'd enter into complicity with hostile political and economic systems, or else parodying them. In a sense, the French playwright Jean-Richard (no relation to the German theorist, Ernst) was making a point similar to Lukács, who in History and Class Consciousness tried to provide a more robust philosophical basis for Leninist internationalism and anti-“tailism.” "Reification referred not to the workers’ quotidian consciousness in capitalism, but to the 'class consciousness' of the workers," some have argued, "as expressed by Social Democracy ('Marxism') at its height. For Lukács and those who followed him, 'reification' meant Kautsky." Bloch the playwright was already an orthodox Marxist in 1912, when he sent Lukács a literary questionnaire via his contact Félix Bertaux. Lukács was just then embarking on what he'd later characterize as his romantic anticapitalist phase, but like Monsieur Bloch moved into the Bolshevik camp after the crisis and eventual collapse of Second International Social Democracy in August 1914. Jean-Richard appended a brief postscript to the exchange between Satan and Marx — a scene from an alternate history set at French headquarters in 1915. One officer states "the Germans occupy me much less than the revolutionaries… What are we to do against an enemy who's neither in Jerusalem nor Moscow, who is everywhere and nowhere at once?" Entering, an orderly reports: "The German army has just revolted and laid down its arms, and now the third, fourth, and fifth French armies have revolted and are fraternizing with the Germans. No bloodshed has been observed." Again, the Faustian dimension of Marxist thought acquired a more melancholic aspect following the defeats of 1914 to 1923, because the revolutionary proletariat — whose very existence heralded the "dissolution of the previous world-order" — had failed to manifest. The propitious moment had been missed. But the catastrophe was only beginning. New horrors lay in store. Just a decade or so after the communists abandoned hope in a German Revolution, National Socialism seized power. "For many the choice between Bolshevism and Nazism is rather like a choice between Satan and Beelzebub," wrote Trotsky, clearly aligning Bolshevism with Satan. "I shall find it difficult to say anything comforting about this, as it is clear that the twentieth century is the most disturbed century in the memory of humanity…" One of Trotsky's closest supporters in South Africa, Frank Glass (alias Li Fu-jen), assumed a second pseudonym that same year: Lucifer, which he used in writing a series of articles on the various missteps made by the Chinese Communist Party in the decade after that country's revolutionary crisis of 1925. Walter Benjamin's hallucinatory protocols on hashish around this time attest to the same satanic melancholy: "I recollect a satanic phase. The red walls were the deciding factor. My smile assumed satanic features, though it was the expression of satanic knowing, satanic contentment, a sense of satanic calm… rather than satanic destructiveness. People became more deeply entrenched, and the room itself became more velvety, darker, more aflame." Gershom Scholem, Benjamin's longtime friend, speculated that the famous angelic metaphor in On the Concept of History (1940) might be an allusion to Satan, who after all had once been an angel. According to Benjamin, the metaphor was inspired by "a picture by Paul Klee called Angelus Novus" he'd acquired a few years before, depicting "an angel which seems about to move away from something that he stares at… His eyes are wide, his mouth is open, his wings are spread." Scholem surmised the angel secretly embodied "Satanic-Luciferian thoughts," however: "The Satanic character of the angel is emphasized by its claws and knife-sharp wings, which could find support in Klee's depiction. No angel except Satan possesses claws and talons." Based on some cryptic fragments Benjamin signed as Agesilaus Santander, Scholem made another discovery: "Agesilaus Santander is, sealed as it were with a superfluous 'i,' an anagram of der Angelus Satanas." Two demoniacal post-1919 visions may be treated as exemplary of the period as a whole: Andrei Platonov's short story "The Satan of Thought" [«Сатана мысли»] (1922) and Aleksander Wat's novella Lucifer Unemployed [Bezrobotny Lucyfer] (1927). Each evinces an unmistakable melancholy, albeit achieved by different means. One is tragic, while the other is comic. Significantly, both Platonov and Wat were Marxists when these stories were written. First, Platonov's tragic "Satan of Thought." Published in the minor Proletkult journal Path of Communism close to the end of the civil war, it tells the story of an engineer tasked with transforming the universe. Vogulov, its main character, grew up "in the great epoch of electricity and reconstruction of the globe." (Here yet again, the Satanic merges with the Promethean). Distinguishing himself from an early age as a virtuosic student, Vogulov is appointed to direct future development at the world gathering of the working masses. Organizing their efforts to overcome "the monstrous resistance of matter" so that humanity might finally feel at home in the cosmos, he modifies weather patterns and rearranges the Sahara and the Himalayas. Microbes of energy [микроб энергии] are harnessed in a concentrated form as "ultralight" [ультрасвет], allowing Vogulov to cut through continents and alter the course of waterways. "For earthly humanity to be able to rise up against the world and the worlds, and attain victory over them — it must bear within itself a Satanic consciousness [сатану сознания], diabolical thoughts, and kill in itself the floating, warmblooded divine heart." The price that Vogulov paid for genius in his youth was witnessing the death of a girl with whom he'd been infatuated, only a week after they'd met. At the end of the story, haunted by loss and a closed universe, he decides to blow up everything with utlralight instead. Second, Wat's comic Lucifer Unemployed. Published by F. Hoesick Verlag in Warsaw, the last chapter of the book has Lucifer offering his services to a proletarian atheist publication, Death to the Gods. "I know all the secrets of creation and will reveal things to you no one else knows. Besides, I'm the personal enemy of God." Lucifer is shocked to find out, however, that the senior editor has no use for him. Everything that could be known is known already, thanks to science. The devil searches around for employment but finds all the abilities he used to monopolize through sorcery and magic are now the common property of mankind, only in disenchanted form: "Modern times belong to technicians — Edison is the Merlin of the twentieth century. What can a poor devil become in these times if not an inventor?" Here again Lucifer fails to achieve anything that others haven't already; the supramundane has lost all competitive advantage over the intramundane. Never much of an athlete, the light-bringer likewise fails at sports. Unfortunately for him, "sports are the only rational ground on which patriotism can express itself in humanitarian competition between classes in an age of pacifistic democracy, where the workers' team defends its crest against the bourgeois team and rips apart the net of capitalism with a goal far more effectively than a terrorist bomb." After trying his hand at a long string of professions, Lucifer finds the only path that remains open to him is in show business: "Lucifer became a film artist who everyone knows; he's Charlie Chaplin." The universal proletariat is the modern Satan, the great rebel — vanquished, but not pacified [«le Satan moderne, le grand révolté — vaincu, mais non pacifié»]. I recall only two mentions on this site of G.M. Tamas work 'Telling the Truth about Class' added to what appears a more than comprehensive tracing of the 'Demonic' theme here by someone clearly more widely read than I - so have bookmarked for a closer read later. This text seems related in part to the longstanding seemingly (on the face of it) contradictory Marxian interpretations of how the proletariat might come to break with capitalism and start a transformation towards communism - either as a sudden elemental response to the unbearable exploitation, oppression and alienation imposed on it by capitalism or alternatively as a process involving the slow evolutionary build up of class organisation and with it class consciousness preparing for the final assault on capitalism and fitting the class for the practical and 'moral' task of running the new society. Given the failure of Marxian influenced social democracy and it's anarchist-syndicalist equivalents to prove the validity of that second approach there has been a growing interest in other approaches which look to more spontaneous social movements other than the traditionally defined 'workers movement'. The other aspect in this text is it's assertion of the inherently 'secular' and anti-religious nature of the most radical tendencies in the early anarchist and communist movement as recognised by both it's adherents and enemies but also the degeneration of such radicalism following the failure of social movements inspired by such. Still the text concentrates on how all these social tendencies were represented by various intellectuals reflecting on them and as such that representation must still be open to question in terms of it's relevance then and more so now. I thought some amongst the 'Communser' tendencies or maybe one Tom Henry might find this of interest. Still interested in this if anyone else has read it and has a point of view? Hahaha – you hooked me in! Swine! For me the best thing about the text is that it is an interesting gathering of materials together. It is well worth, in my opinion, exploring the avenues it suggests. The real battleground is consciousness. However, if one reads the first paragraph of the text and then the book, The House of Government, by Yuri Slezkine (particularly the first section initially), one might perhaps unearth a theme in revolutionary praxis that extends (at least) all the way back to Moses and the ancient Israelites. I (unlike Slezkine, I think) would define this ‘theme’ as an inevitable tendency that is periodically set in motion by living within a State. Karl Jaspers termed the emergence of the new wave of thinking represented by such as Zoroaster, Confucius, the Buddha, the Upanishads, the ‘hundred schools,’ Greek philosophy and tragedy, etc – as the ‘axial age.’ (It could also be described as the time when chiefdoms became States, when the survival of the ‘chiefdom’ relied on the bureaucratic retinue of the chief, rather than the personality and strength of the particular chief.) Anyway, this was, according to Jaspers, the time when self-reflexivity became a/the dominant mode for thought. It is perhaps no surprise that philosophy and ‘religion’ emerged at the same time as the State did. It is also perhaps no surprise that the notion of ‘human’ consciousness, as we understand it and as we investigate it (from Plato, to the Tao, to Spinoza, to Marx, to Dennett, etc), emerged at the same time. They managed to carry out the whole [unifying] “program” of the chiefs with a single stroke. I’d be interested in observing (but not participating in) discussion here on the Slezkine book, as well as a (now overdue?) general one on how people regard their ideas in relation to postmodernism/relativism (identity politics etc) and the opposing defence of ‘Enlightenment reason’ pushed by such apparently contrary figures as Miguel Amorós (eg: https://libcom.org/library/catalonian-affair-miguel-amor-s), Frank Furedi et al, and Zizek and Badiou, etc, for example (the ‘battle of ideas;’ the reclamation of ‘communism as an idea’ etc) – since it appears to me that an understanding of this debate is helpful in better understanding the development of, what appear as, ‘Libcom’ positions, and in particular the recent split in the AF.